A skill that follows hard on the heels of self-awareness is self-regulation. In order to regulate our lives, we must be aware of our emotions, understand their source, and take the necessary time to consider what to do about how we feel. A person who exercises self-regulation (self-control) is one who understands that just because he feels strong emotions doesn’t mean he has to act on them. He is not likely to be swamped and lose control in the heat of the moment; rather, he will view his emotions as important sources of information but will also consider his options and choose how to behave in the face of what he is feeling. An emotionally intelligent person will understand that there are two brains at work–the emotional and the rational–and that while each plays an important role in life, they must work in concert. Neither brain is good all on its own. A critical part of self-regulation is the ability to act in ways that will soothe the emotional upset and create time and space for the person to consider how he feels and more importantly, to decide how to respond to the upset. For some people this means going for a long, brisk walk outside. The physical exercise, the breeze, and the sounds of crickets or birds all combine to soothe the ruffled spirit. For others, getting engrossed in a good book, digging in the garden, or going for a bike ride is calming. Basically, especially with negative emotion, it is important to gain the ability to think and consider before acting. Choosing an effective calming activity ahead of time will help tremendously. A person who has had a difficult day at work is less likely to go home and kick the dog and thus spread a bad mood at home. Instead, he can choose to do something relaxing to change his mood. Self-regulation helps a person achieve a difficult goal. For example, a teen exercising self-regulation will choose to complete his term paper in spite of the fact that his friends want to go to a movie. He is a teen who has been taught to defer gratification in the interest of reaching a desired goal. A person who can regulate his emotions will be able to plod away a step at a time to reach a goal. A child who has been taught self-regulation will resist the temptation to shove a child on the playground who has been mean to him. He can choose to move away and play elsewhere. Self-regulation will prevent us from giving in to rash urges that we will later suffer consequences for. Very young children can learn that they don’t have to act on their strong emotions, but it takes adult caregivers who understand the relationship between the thinking brain and the emotional brain to guide them. Parents themselves must keep the thought present at all times that they are there to teach their baby to learn how to deal with their upsets, not there to facilitate giving the child every little bitty thing he thinks he has to have. One of the earliest ways of teaching babies the art of self-regulation is to soothe them when they become upset. This might mean a walk around the house as you pat their back and hum a song to them. It might mean playing soothing music. The child will over time learn to soothe himself just as his parent soothed him. Certainly it will not help for the adult to become agitated when the baby is already bent out of shape! Calmness, soft talk, and gentle arms will combine to soothe the upset baby. Changing the scene is also very helpful in helping a baby change his mood. We can soothe a crying tot by using distraction, by talking to them, and by acknowledging their upset, but then what is critical is that we remain focused on what is best for the child. He will need to learn to make good choices for himself, and the time to start teaching him is day one. If a playmate takes away a toy, the little tot will be really tempted to go rip it out of the other child’s hands. We can help the upset child to understand that while the loss of the toy feels tragic, the loss is temporary and there is another toy he can play with right now. “You had a lot of fun with that toy. Just imagine how much fun it is for Jack to have a turn with it!” Wait until Jack puts the coveted toy down, and then give it to your child. He will learn temperance, patience, and consideration of others along with the all-important skill of self-control. By far the best way to teach the skill of self-regulation is by example. Children, even the very young, will mimic your habits. 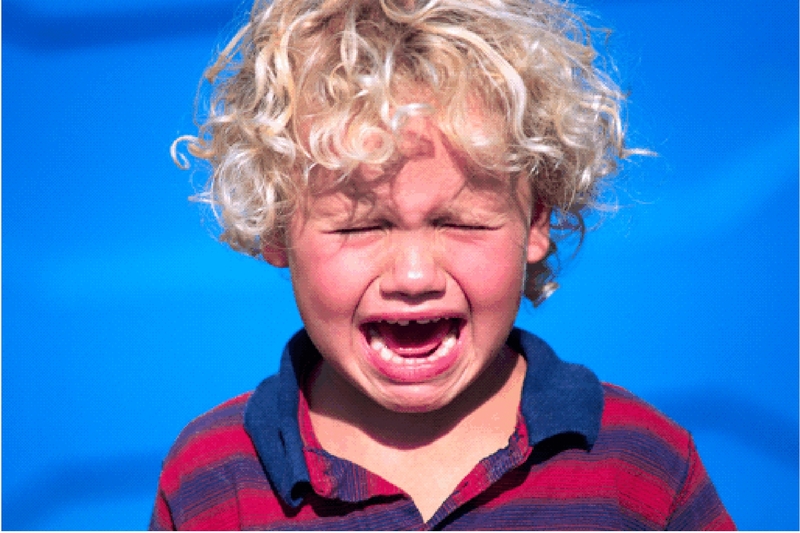 It would be super hard for a child to learn self-regulation if he regularly sees Mom or Dad lose emotional control! A great way to help tots become adults who have the persistence to work hard towards their goals is by giving them responsibility very early on and making sure they fulfill their responsibilities before stopping to play. As soon as a child can walk, he can learn to put his shoes in his closet and can put toys into a toy box. Rather than doing everything for him, instill a sense of competence, of mastery, and of achievement by giving him jobs at home and letting him feel that he’s a significant contributor in the family. Teach him to delay gratification by helping him save his pennies for things he wants rather than just giving him everything. A student I had a few years ago is a perfect example of someone who did not learn self-regulation. I will mercifully call him Frank rather than revealing his true name. Frank had been endowed with tons of IQ, but he used his smarts to create novel ways to avoid doing anything he didn’t FEEL like doing (which included everything except playing electronic games and eating). I learned this about him when I taught him in 1st grade. I’d been around children of all kinds for many years and this child managed to take me by surprise. He fell out of his desk noisily on a regular basis, continually made nasty body noises, broke and ate his pencils, ripped his pages, “lost” his homework, daydreamed, pinched the child next to him, wrote with magic marker on his desk, perpetually erased anything he began to write…you name it, he thought of it. Somehow, in spite of himself, Frank learned to read well. At the end of that year, I looped up with Frank’s class and taught them in 2nd grade. The first day of school dawned all fresh and new-pencil-smelling. My angels came in, found their desks and began to rummage excitedly in them to see all the cool new learning stuff I’d stashed there. Frank wasn’t impressed in the slightest. The next morning when it was time for geography, I instructed the students to find their purple geography folders in their desks. My words were still hovering in the air in front of me when Frank’s hand went up. “I don’t have one,” he stated flatly. “Of course you do,” I replied. “You just haven’t looked for it.” I went back to Frank’s desk to locate his purple folder only to find that Frank wasn’t just missing his purple folder, he had nothing at all in his desk except a stray fuzzy. It turns out that Frank had loaded the contents of his desk into his book bag at the end of the first day. When he got off the bus at the corner near his house, he emptied his book bag into a convenient dumpster. His IMPULSE was to throw away the offensive books, assuming (without really thinking rationally about his impulse) that he’d escape having to do school work for the whole of second grade! For two years I watched Frank give in to his impulses and suffer consequence after painful consequence. He never did learn from his difficult experiences to curb his impulses, to delay gratification, and to have goals. He never seemed to get the connection between his impulses, the consequences, and how he could really get what was important to him. This kind of situation points back to early home life. This is where important life learning happens or doesn’t happen. Frank had parents who coddled him, thinking this equated love, but tragically, what they did was deprive Frank of any chance of making anything out of himself. I have a friend that self-admittedly didn’t have the native IQ that Frank enjoyed. She was just an average student. Francis did, however, have an incredible work ethic. She knew how to persist, how to keep on going in the face of tremendous difficulty in order to achieve a goal. By the time she reached college, Francis had chosen a career in medicine. She knew the path she’d chosen would be considered an impossibility given her native talent, but she was determined to succeed. Obstacles came and she quietly and doggedly persisted. The first time she applied to medical school, she was rejected, so she spent a year studying with even more intensity so that when she applied a second time, she was accepted. That was in the mid ‘70s. Today, Francis is a very well-respected general practice physician in a major city with decades of medical practice under her belt. EI (emotional intelligence), not IQ, made the all difference for her. A big challenge for parents of really small children is obtaining and keeping perspective in the face of really messy emotional displays on the part of their children. When our child is screaming and red-faced, with their snotty nose blowing bubbles, and arms and legs flailing …well frankly, we just need the emotions to go away. Our impulse is to quickly give the child what he wants in order to pacify him. We can very quickly put ourselves into the position of supplicant and once this happens, it is all over! The child, ANY child, can sense automatically when his parent has become a supplicant, and this tells the child that he, not parents, is calling the shots. This transfer of responsibility happens almost imperceptibly, and when it happens, the parents’ work has suddenly become exponentially more difficult. There must be a measure in place that we can reach for when we are in the throes of a messy tantrum. The measure will be called “what is best for my child.” Some things we want our children to do are things that concern their welfare. Those are not negotiable. Other things are totally negotiable. But how to tell the difference in the middle of a tantrum? Decide ahead of time and write down on paper your desires for your child. Safety (seatbelt, holding hands in public places, etc.) Anything else that has nothing to do with safety, health, welfare, security of child. It helps for us to be crystal clear about which things we need our children to comply with before we get into a heated and very emotional situation with them. If we are totally clear that our role as parents is to help our children become responsible, well-functioning adults, it makes it easier to make decisions that are good ones for our children. Years ago, a family counselor helped me clearly understand my role as a mother. He said, “You are there to teach your children everything they need to know to become high-functioning adults who are successful, contributing members of society… by the age of 18.” I went home with swirling thoughts, but wow, I was super-clear on what had to happen in our home before either child reached the age of 18. By the time they left home, they had to take responsibility for ALL their needs, had to know how to cook, clean, do laundry, get their chores done without being reminded, had to learn how to make good purchasing decisions, how to handle upsets, how to save money for basic needs, how to keep a bank account, how to pay bills, and how to handle themselves around other people. The job seemed overwhelming, but it’s really not if we start when our children are babies. Little tiny steps with toddlers turn into powerful life lessons for teenagers who are a breath away from adulthood. Instead of asking, “Aiden, can I change your diaper before we leave?” or “Aiden, let’s change your diaper, ok?” if you truly believe Aiden needs a clean diaper, just confidently make the statement, “Aiden, come. We’re going to get a clean diaper before we leave.” If we use a questioning tone of voice or any facial expression that leaves room for debate, a toddler will see and hear that more distinctly than your verbal direction and they will believe they have a say in those things–and we all know what a toddler says is NO. Our children need to understand very early on that some things are just things we do because they are right and it is not open for discussion. Our own confidence and calm manner will convey powerfully the notion that we are the parent and know what needs to happen, and the child will far more frequently go along with our calm assertion. If bedtime is a predetermined routine, it will be easier for your child to understand that this is also a non-negotiable event and just a part of the flow of his orderly, safe life. Routine is your best friend when it comes to getting your child to happily cooperate with you. If you leave the routine up for grabs, your brainy tot will come up with a variety of activities in which to engage, and you will lose the battle. I promise. So, decide ahead of time what bedtime looks like in your ideal world. *Remember that the more matter of fact you are, the more your child will naturally cooperate. This is a touchy subject. What a child should eat, how much, when, etc. My personal opinion is that we must take the attitude that food = fuel for the body and that good nutrition is essential for good health. In our society, food has become totally about entertainment and self satisfaction and even comfort. We’ve lost the notion that food enables our bodies to grow and be healthy. From the first introduction of solids to a baby, good nutrition needs to drive our choices of food to feed baby. If we introduce good, nutritious foods early on and regularly introduce new foods, a micro-bite at a time, we will end up with children that are able to eat vegetables, are not afraid to try new things, and who don’t automatically reject green things or foods with different textures. There is so much information out there already about what commonly accepted “kids’ foods”** contain and how much damage those foods do in terms of poor health and obesity. The best way to conquer obesity in children is to stock the fridge and pantry with the good stuff and eat those things with our children so they can begin a life-long habit of eating right.